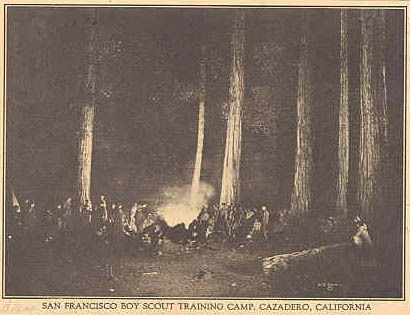 After the Howard ranch was sold, the San Francisco Council required a new location for their summer training camp operations. 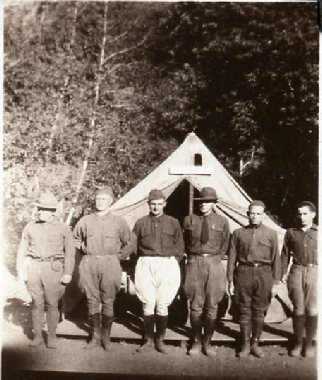 As early as 1917 the Council had looked at a number of sites for their training camp including one site near the town of Cazadero on the George S Montgomery property. 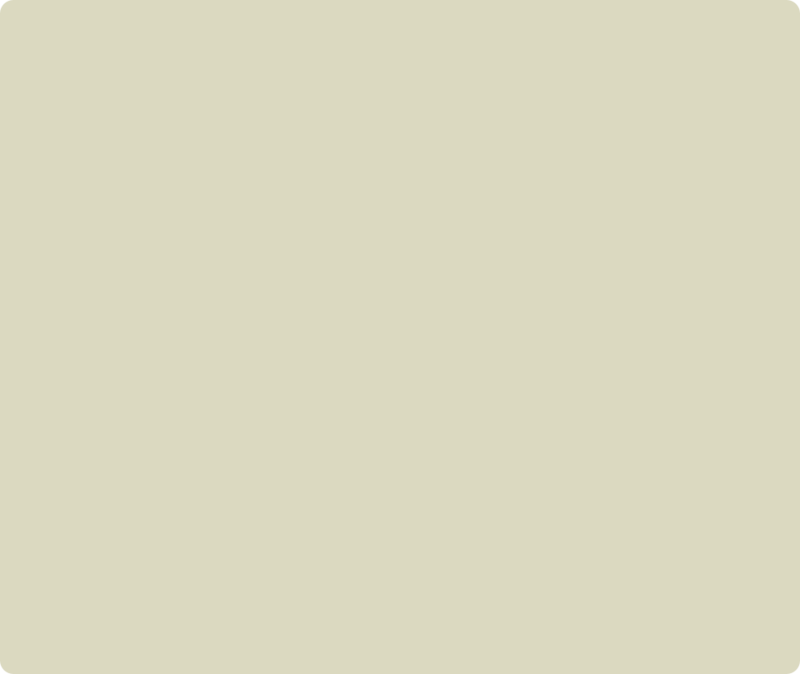 Back in 1917 the Cazadero site had generated the most interest but was not chosen due to its location. The Cazadero site was located one mile south of the town of Cazadero in Sonoma County along the banks of the Austin creek at Elim Grove. (One mile from Cazadero, thus Mile spelled backwards). 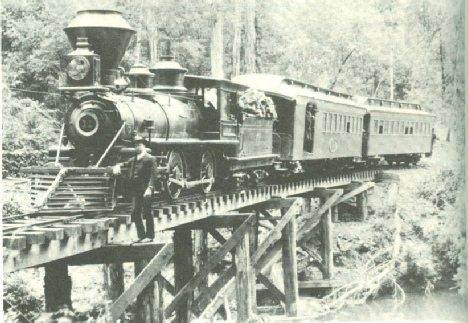 The site was also directly adjacent to the narrow gauge train tracks of the Northwestern Pacific railroad (which ran from the town of Duncan Mills along the Russian River over to the town of Cazadero). 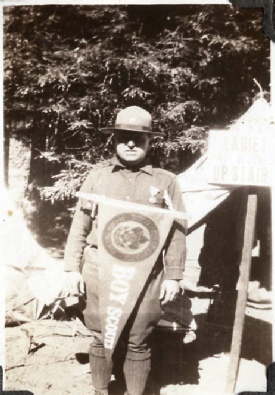 The site was still available for use from the Montgomery family and the Council selected the location as the new semi permanent location of the San Francisco Training Camp which was also known as Camp Redwoods. Several buildings were constructed on the site including a field kitchen and latrines. Other equipment in the way of boats were also provided that was lacking at the previous two locations. At a wide spot in the Austin Creek, a 150 foot wide gravel dam was erected for swimming and boating. Over two hundred scouts and leaders boarded a ferry in San Francisco for the first leg of their journey across the bay to Sausalito where they would catch a train for the remainder of the trip. In Sausalito the scouts caught a special Northwestern Pacific train destined for the station at Elim Grove and two weeks of fun and adventure. The train stop at Elim Grove was approximately 77 miles from Sausalito and would take about three hours of travel time including a stop at Duncan Mills. 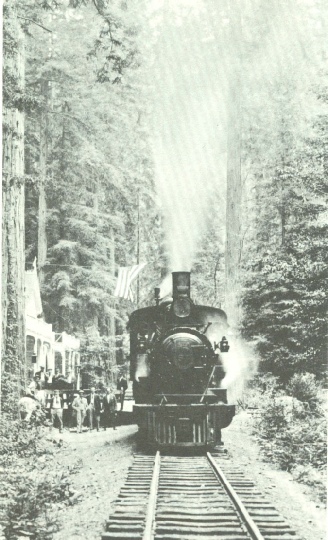 The rail line from Sausalito to Duncan Mills was standard gauge, but the rails from Duncan Mills to Elim Grove was narrow gauge. This change in rail gauge necessitated the need for the scouts to transfer over to a narrow gauge train for the remainder of the seven miles from Duncan Mills to Elim Grove. 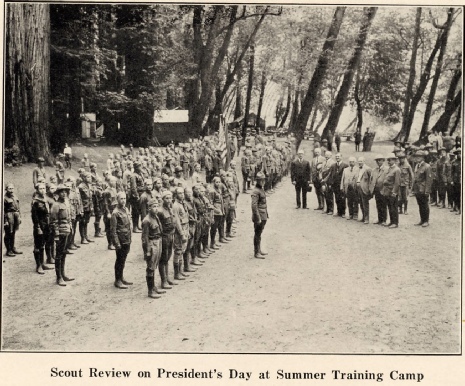 During the first week at camp, the scouts hiked from Elim Grove over the hills to the town of Guerneville where they had a “good hot dinner” and camped overnight next to the Russian river. The next morning the scouts took a dip in the river before trekking fourteen miles back to Elim Grove by way of the railroad tracks. 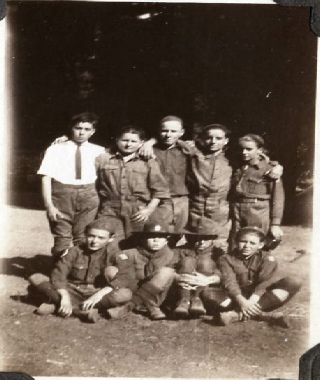 A total of four hundred and four Scouts and leaders were in attendance during the four weeks camp was in session that first year. A portion of the former camp site is now occupied by Raymond’s Bakery at the Elim Grove location.